It's the daily struggle that we all know too well. Your battery is on 20% and you definitely had full charge when you left the house this morning. Having to carry around a charger is not the one, this we know. Here are 5 battery-saving hacks that you need to try! You've probably heard this one, but it's true. Experts recommend keeping your phone charged from between 40-80%. A full recharge will shorten your battery's life span so leaving it on overnight is not going to help your battery last all day. Stick to topping up your phone in small bursts throughout the day. If you have iOS9 and 8 you can see which apps are your biggest battery drainers. Go to Settings > General > Battery and scroll down to see which of your apps were the biggest battery guzzlers in the past 24 hours, or last 7 days. This can help you consciously use them less if you know you'll need extra battery. Plus, if you've got an iPhone and have updated to iOS9 there is a new feature called Low Power Mode which reduces power requirements when you have only 20% battery remaining. 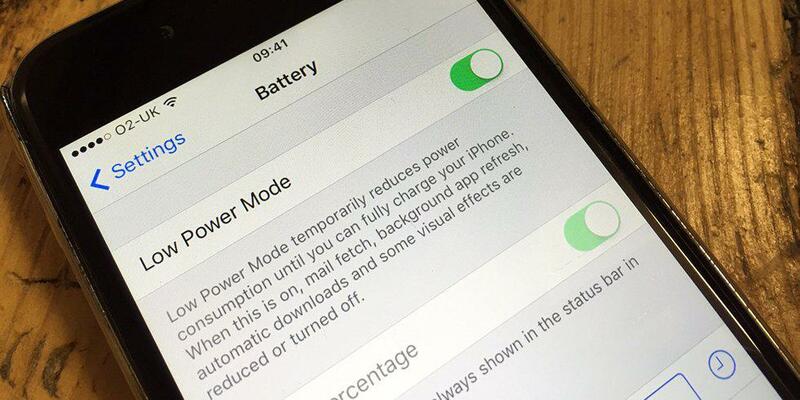 Apple claim that this new mode can lead to an extra three hours of battery life! Snazzy. Don't know if you've got it turned on or not? Head to Settings > Battery > Low Power Mode. Facebook is the biggest battery killer for Background Refresh, it will keep refreshing the content that all your friends and the pages that you like are updating throughout the night, make sure that you turn it off. A similar battery drainer to this is not realising that you're automatically synching to The Cloud. You can easily stop this from happening by going into your app settings and turning your synching from automatic to manual - this can also save you some precious data! Brightly coloured wallpapers can leech your battery, especially if you have an OLED screen like a lot of Android phones. As opposed to using the free versions if you're really concerned about your battery life. Free apps with ads use 33% more battery than apps without ads, that's worth £0.79, right? Plus, using Airplane mode makes your phone charge quicker, so if you're off out and you need a battery boost, pop your phone onto Airplane mode and watch that percentage rise!